Impala Database Firewall developed by DataSunrise acts as an intermediary between database users and the database. The Database Firewall monitors and filters all database traffic. Suspicious and forbidden actions, queries and transactions are blocked in real time. DataSunrise ensures the highest level of protection of sensitive data against malicious attacks, SQL injections, access rights abuse for Impala databases. Most databases have pretty basic in-built security and the Impala database is no exception. So, it requires Impala-oriented solution that can protect it. And DataSunrise has one. The offered solution can be used to protect development, production and test databases. Impala Database Firewall is usually deployed between a between a database and clients. It serves as an inspection point that monitors all database traffic and makes sure that the queries that don’t match security Rules are blocked. Also, the database security team is alerted if something bad or suspicious is happening. 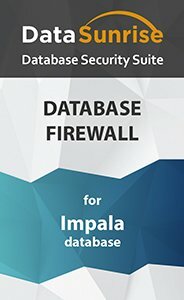 Or Impala Database Firewall can disconnect suspicious users itself. These firewall Rules are highly adjustable and versatile which guarantees that database security demands of any company will be met. To make database protection easier DataSunrise developed the learning mode in which the firewall analyzes all database traffic and identifies the most common transactions specific for the particular environment. This information will be used for white-listing. Also, Impala Database Firewall is a very convenient tool for managing corporate user rights. In companies staffing hundreds and thousands of employees it’s sometimes important to set what employee should or shouldn’t have access to some data. Firewall Rules are very user-friendly and having them saves a lot of time for database owners and admins. This is achieved through automating essential procedures of maintaining Impala database security. The most common way hackers get access to sensitive data is through SQL injections. Impala Database Firewall from DataSunrise easily detects all types of SQL injections. Using Impala Database Firewall from DataSunrise is an indispensable condition for compliance with national and international sensitive data protection regulations such as GDPR, SOX, PCI, HIPAA. Try now for free or contact us to request a demo.